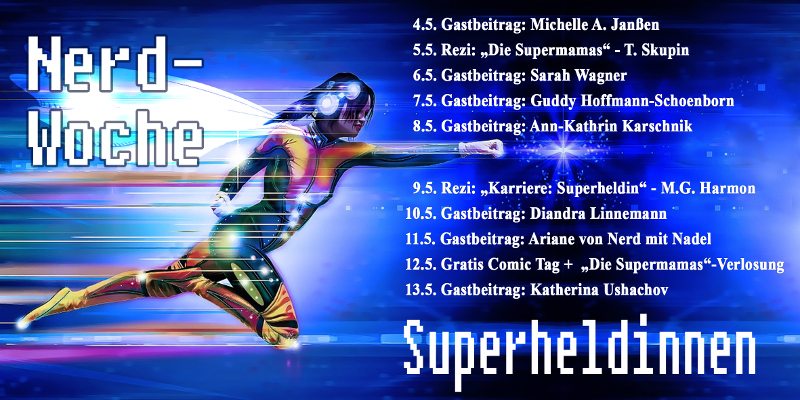 As I said in the review for Letzte Instanz: I split apart what I wanted to write about the concerts I attended this year. So here is the continuation of my reviews. There he said he’d meet up with friends and as they had tickets for the ranks and mine was for the arena itself I parted from him and entered the building. The Tempodrom is a huge building which kind of resembles a circus tent. You have the stage on the far side, which is the entrance of the artists. In front of it there is a round flat area, the arena. And then the whole things is surrounded by the tribunes, with quite a number of seats. As I said, I had a ticket for the arena, so I made my way to a position where I could see well. Soon enough the musicians entered the stage, but the audience didn’t really do the same. My guess is, that the arena was only half full, while the ranks were nearly empty. Tobias even claimed that a Berlin audience is always hard to catch and hard on the musicians, but that they still would give their best to turn the Monday into a Friday (or Saturday, I don’t remember, but it was something like that). At the Blind Guardian concerts at Wacken and at the Metalfest the singer didn’t speak English, though he knew of the multinational audience. This might as well be due to the fact that he has quite a horrible accent, but still. On the other hand, when Sabaton play in Germany they talk English with a few German words here and there, but if a German were to attend a concert of them in Sweden, I doubt they would do that throughout the whole concert. For a few things probably, but not for the whole thing. In conclusion: I have no idea why he decided to switch to English, regardless of the people expecting him to use his mother’s tongue. Regardless of that and the fact that he really talks a lot, the concert was great. Not as great as I had expected due to the weird atmosphere of a half-full location, but still great. They played a nice mix of old and new songs – even some that are around 10 minutes long – and showed me that all those ballad-like songs from the latest album are indeed quite rock-ish (Black Orchid has become one of my favourites of the record). The songs just have so much more energy when played live, with all these brilliant musicians. I mean they had Kai Hansen, Michael Kiske, Bob Catley, Amanda Somerville, Eric Martin, Ronnie Atkins and more. It was great to see and especially hear all these amazing singers. It was also great that some of the songs where usually Tobias sings the main part in the vocals were sung by other people and I have to say that those sounded even better. The chemistry between the musicians was also quite amazing. Though it gave me the chance to see that there were still a few people standing outside, for whatever reasons, but they wouldn’t have managed to fill up the arena either. Anyway, some of my highlights, beside the ones I’ve already mentioned, were definitely: The Scarecrow, Twisted Mind, Dying for an Angel, The Seven Angels and Sign of the Cross. 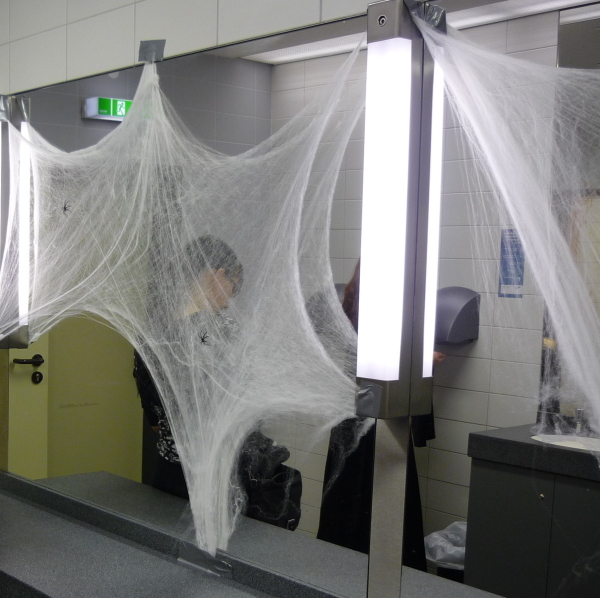 Unexpectedly also What’s Left of Me, due to the amazing performance of Eric Martin. Well, after the concert when I went back to the station – which I found through following random people and again asking for directions – I saw the guy from before again, typing away on his phone. Until he had to get off the train we continued our conversation, this time obviously about the concert itself. He was positively surprised that they had played so many of their longer (~10 min) songs, but I assured him that they also did that during their performances at Wacken, which was much shorter than the concert here. When we parted again he said that we’d see us again when Avantasia would return to Berlin, but I doubt I would recognize him again…I can’t even remember what his name was…. As I will not attend another stand-alone concert this year I’d like to give you a little review about the ones that I’ve been at. Like last year I wanted to write about them in one post, but it was soon clear, that that would end up being a horribly long post, so I split them apart. Avantasia [were] returning to the stage for up to three hours of performance. I always wanted to see them alone and not “just” at Wacken. Letzte Instanz play[ed] a concert in a small club in Rostock – far too close to resist. Stratovarius (and Amaranthe) play[ed] in Hamburg, they’ve been great in Wacken (and Hamburg) that seeing them alone would be great. It soon was clear that I couldn’t attend every concert I would have liked to. Especially as it looked like I would be writing my Bachelor’s thesis in the beginning of the year. That however soon changed, when I decided to take a breather from all studying related stuff and postpone the thesis until fall (which is now fast approaching). Nevertheless I started asking people what they thought about the concerts. 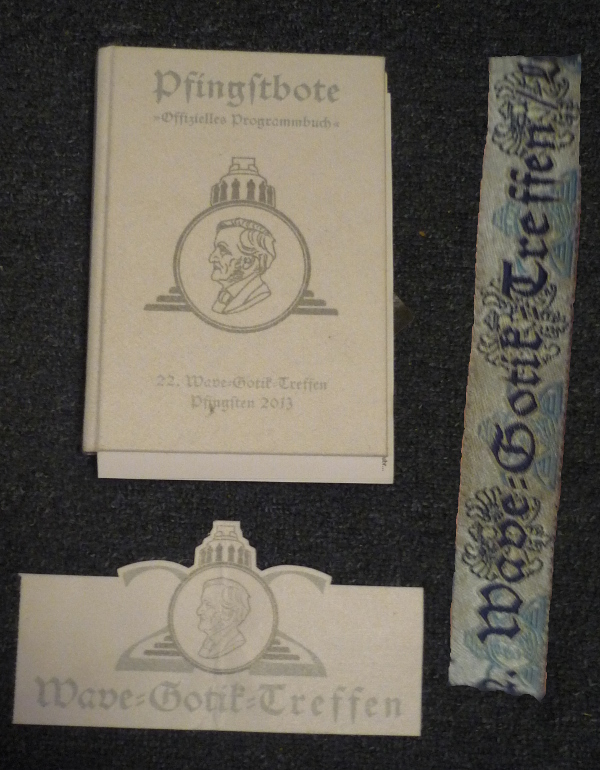 During one of the Dark Noirs (Gothic-Parties I might have mentioned before) Black Kat made me talk to another member of the group Mücke (short for Brüllmücke/Roaring Midge), who had just asked her what concerts there would be in 2013. He said that he wouldn’t mind seeing Letzte Instanz and Die Ärzte live and that I should write him the dates and the prices for both concerts. Shortly after I did that another member, Kathy, asked if she could join us for LI and Mücke decided to only go to them as well. So only a week after the Paganfest my first actual concert took place. 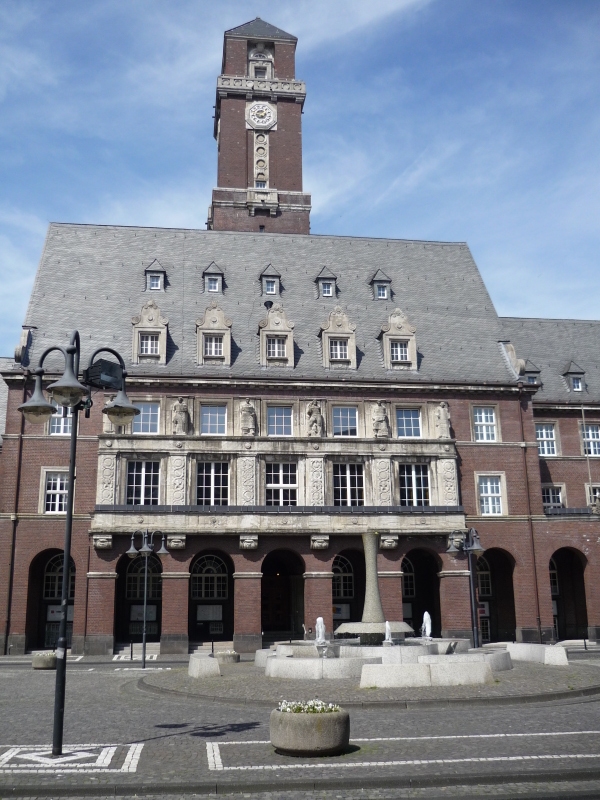 At our local bus station I picked up Kathy and Mücke and we drove to the M.A.U. 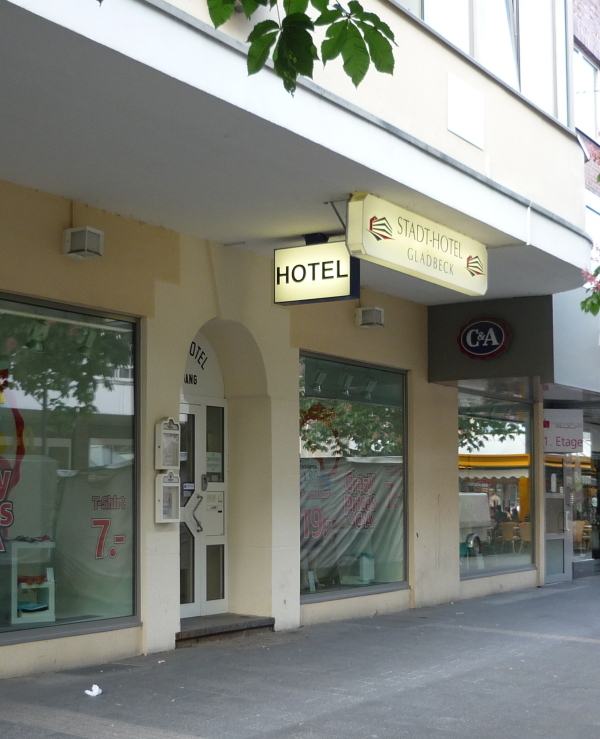 Club in Rostock. As it was still pretty cold I had decided to take the motorway for the route, instead of the – though shorter – country road, which was still affected by snow and ice. The way there was a bit weird as I didn’t really knew either of them that well. I had seen Mücke several times on parties and stuff, but I actually met Kathy the DN after I had agreed on taking her with us. So finding something to talk about was a bit awkward at first. After we had a quite unsatisfying meal we returned to the entrance, only to see that it was not open yet and that only a few people were waiting outside. But as I learned that day: The club hasn’t been filled entirely throughout the last few years. When we got in Kathy and I stopped at the merchandise stand for the obligatory tour-shirt, while Mücke made his way to the bar. With the new purchases in the car and a drink in their hands (not in mine, as I was after all the designated driver) we made ourselves comfortable on one of the many couches at the side of the large room, just behind the sound technicians‘ weird and unsafe looking construction of a platform. The concert started with the support band Lost Area which weren’t that good to be honest; not entirely bad, but I’ve heard better bands. Besides, their set list wasn’t that thought-out either as they constantly switched the style of the (cover) songs. As his (full) nickname suggests, Mücke can be a quite loud fellow, so a few of his remarks even made it to the ears of the musicians. But as they are quite likable people, they did not scold him for it, but found it funny instead. They really knew how to entertain even as little as roughly a hundred of people. Kathy had asked me, if we could stay a bit after the concert so that she would be able to get autographs for photos she had taken on previous occasions. And so we waited for the band to return from backstage. When Kathy went to get the autographs she had asked me to watch out for her stuff and while she stood with them new photos were made by that days’ local photographer, one also of Mücke, Kathy and the cellist together. And being the shy person I am, I stood behind watching her stuff, as I had promised to do. Soon after we made our way back and this time we definitely had much to talk. This years concerts started a bit differently, as it was a mini-festival that provided them. When I looked for possible concerts I noticed that one of the bands I like – Alestorm – would be headlining the Paganfest, which is a series of concerts with about 6-7 bands a day in different cities – that’s why I called it a mini-festival. I had heard little about the Paganfest, only randomly seeing some shirts but nothing concrete, so I did not really know what it was like. I only knew Alestorm would be there and that the Paganfest would have a station in Hamburg and Berlin. Soon I started asking around for company for this (and the other concerts I had found), as I had failed to see Alestorm at the Metalfest the year before. From my initial question Liathano was the first to say yes, even offering me her couch again. But as Black Kat and my other colleague – from now on called „Schnitzel“ – had interest in it too I thankfully declined her offer and told her that I might be using it for the upcoming Avantasia concert – that I’ll be covering some time later. Neither could my colleague and fellow student – Lil‘ kat from now on – , whom I had asked as well, as she had semester at that time. In the end I went with Black Kat, Schnitzel and Anice to the one in Berlin . For quite some time I was certain that the „festival“ was on a Friday, so I was confused when Kat and Schnitzel talked about taking a vacation day for it. But when I realized my mistake I was too stubborn to take a day off as well and decided to just go to work the following day. This way it was also a trial for the concerts after this one as they were in the middle of the week as well. Nevertheless we soon ruled me out as driver for the evening, as my car is simply too slow in comparison to Schnitzels…. As Kat wanted to have a beer for the way Schnitzel joked about still having a bottle from the WGT (Wave Gotik Treffen, you’ll read more about this later) the year before. Only to realize that said bottle did NOT survive the cold (aka freezing) winter…. It is kind of a surprise that Schnitzel hadn’t smelled it previously, but as it was March the last frost hadn’t been that long away and it still is unclear when exactly the bottle broke. When we were finally done Kat „sacrificed“ herself and sat at that side of the car. I’m not sure if my sensitive nose would have survived the trip otherwise. Even though we had put disinfection wipes into the pocket it now smelled of both: The rotten beer and the disinfection stuff…. 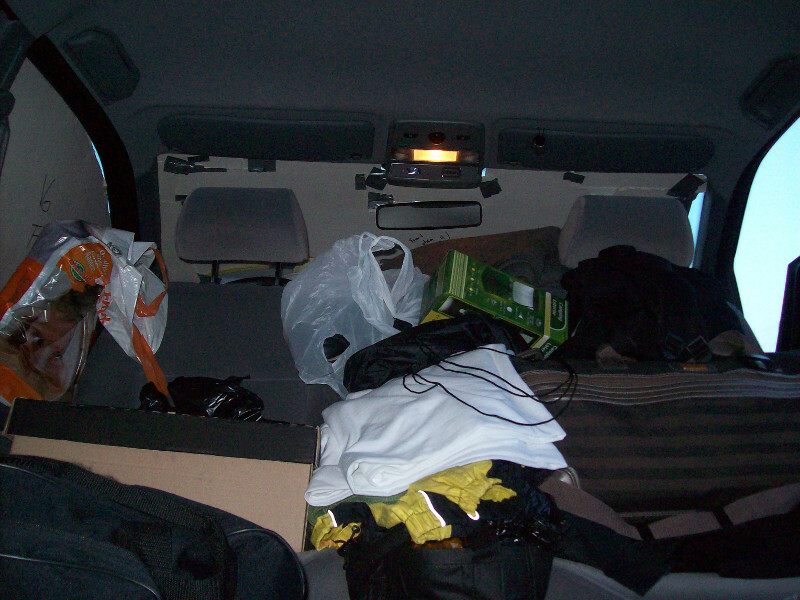 Still, what was most fascinating about the whole trip was for me to have a back seat again. When we had finally found one we had to wait a short moment for Schnitzel to change into more appropriate shoes (Normal shoes at certain concerns just aren’t save enough for your feet 😉 ), before we then took off – the clock already saying that the first band had started. Well the bald head and the chubby body did not really help his case. They weren’t bad, but with the baby in mind you couldn’t really take them serious, at least I couldn’t. Number three was then Canadian band Ex Deo (which is a side project from the guys of Kataklysm as I have just learned). With their suits or parts of Roman armour they looked quite impressive on stage and the music they made wasn’t too bad either. The last one before the ones we were looking forward to see were Bornholm from Hungaria. At this point I was quite annoyed that every band they had picked had a habit of growling their lyrics. I think I already mentioned this in one of my Wacken Reviews, but I am not a fan of this way of „singing“. But as I learned later: Only a few bands that fall into the category Pagan Metal do NOT use growls as this genre derives from Black Metal, though also from Folk Metal, but they only use the instruments from there. With Arkona from Russia there was finally a change in that pattern, as they are pretty good at combining both growls and clear vocals. And all that is done by one and the same woman(!). Schnitzel and Kat had told me that they had seen them at the WGT the year before and the show there was brilliant. They had played indoors as well and the audience moved around that much that they caused the heat in the room to went up several degrees, even causing the sweat to drop down from the ceiling again. Every bit of alcohol the bars had to offer was gone, the people were exhausted – but content – and the main band hadn’t even played yet and all this, while the singer still wore a thick, hairy pelt around her shoulders. I do not want to know how much she could wring out herself after that gig…. Berlin didn’t get as hot as that, but they still managed to grab the audience quite well. And it is really fascinating so actually SEE this woman change from growls to clear vocals in the blink of an eye. I can really understand why people would mistake her as a man while just listening to the records, but if you carefully listen, you will notice that it is the same voice. By the time Arkona had started we all were quite exhausted from standing around all evening so we sneakily had grabbed a stool from the bar room next door and had carried it into the stage room. With this we took turns in sitting. Alternatively the wall behind us – as we stood at the end of the room – provided us with a free foot massage, as the vibrations of the music resounded in it. It was quit a nice way to lose the tension in your feet after standing for so long. After them came the/my main reason to be there: Alestorm. And they were just as much fun as I had imagined they’d be. I can’t really describe what it was like to finally see and hear all these ridiculous songs live, but I know for certain that the other three looked quite questionably at me when I sang and moved along with most of them. We hadn’t been on a concert of one of „my“ bands before, so they didn’t knew what I was like during one. Alestorm is not just funny because of their (pirate-themed) songs, but frankly also because of their singer. Christopher Bowes the skinny, short Rumpelstiltskin – again named by Kat – that has a voice as deep as any bulky guy could have; at least I imagined him to be taller and sturdier before I saw one of their videos for the first time. To sum this up, I think, I can speak for all of us, if I say that we had a good time that evening. Regardless of that we also concluded that it wouldn’t have been bad if we had arrived for Arkona and Alestorm only, as the other bands weren’t really ours. But it was a nice starter for a brilliant concert and festival year. 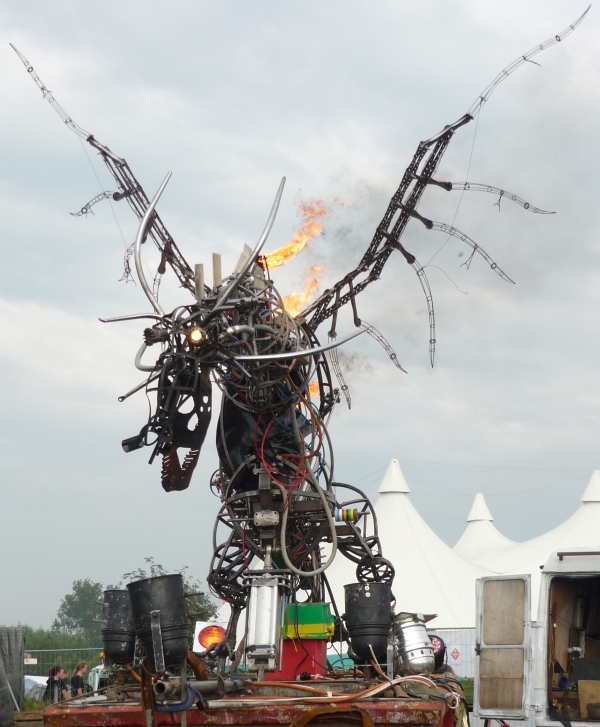 As this year’s Wacken is approaching fast – only about a month left – I’d like to look back at last years festival. 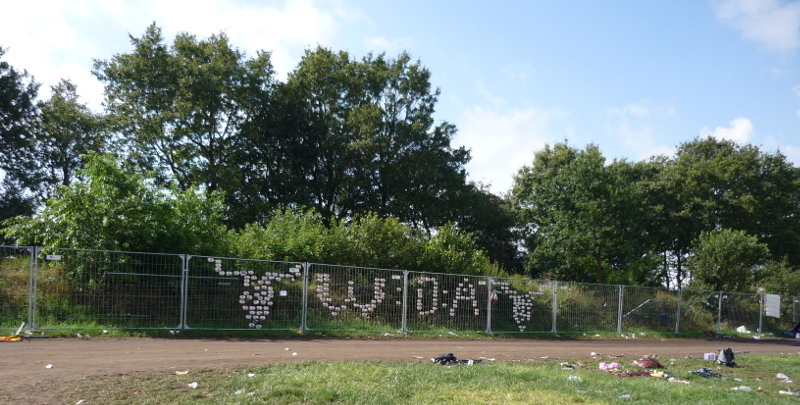 This is the third part of my festival reports about Wacken. 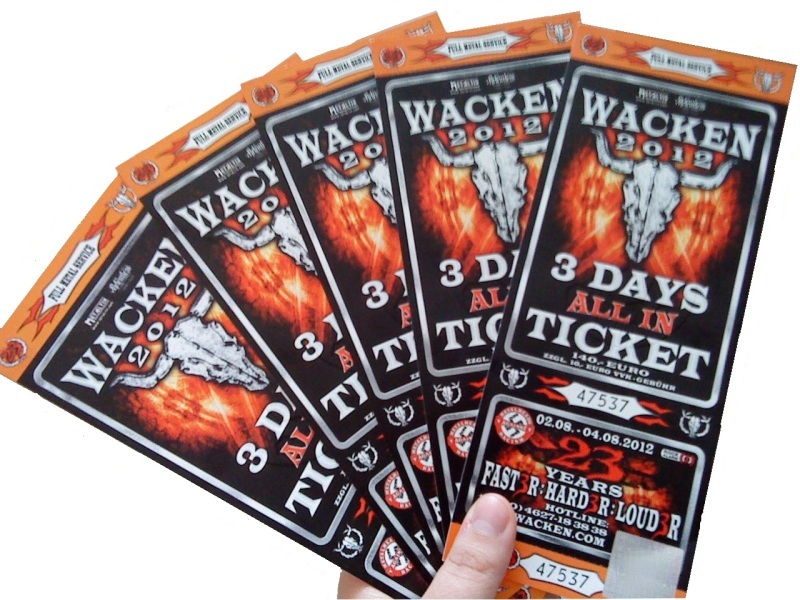 You can find the one for 2008/2010 here: Wacken and for 2011 here: Wacken ’11. You might want to read them before you continue. 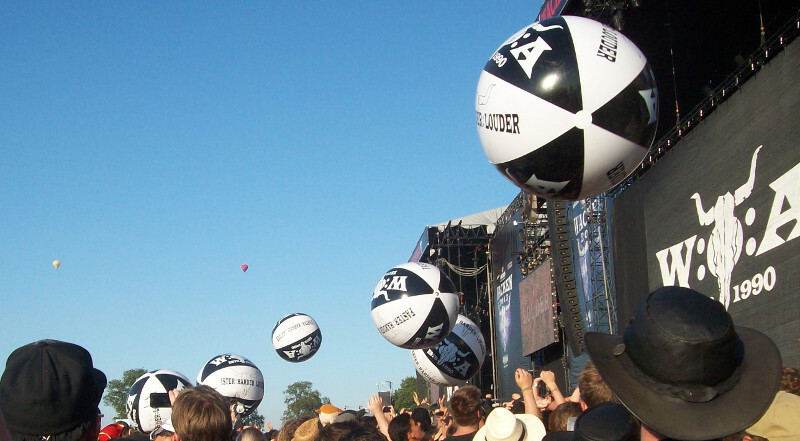 Last year’s Wacken was again different from its predecessors. 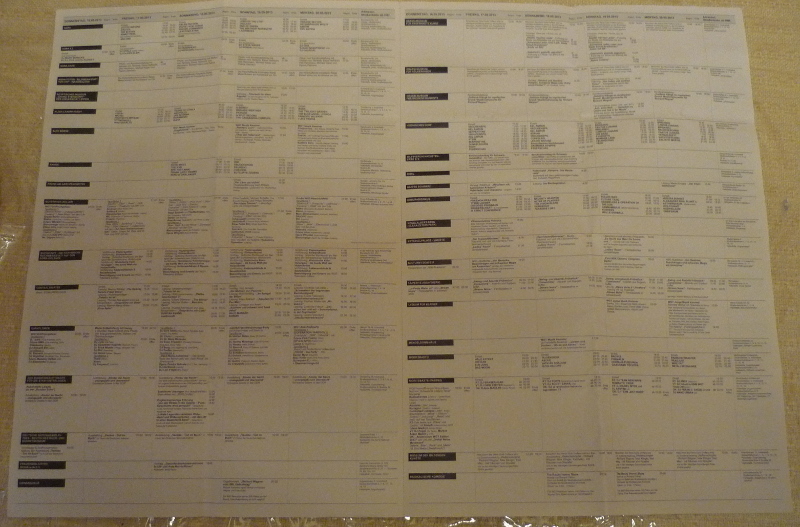 When I finally decided on going there I had no ticket at all, but as the Wacken forum has a sell-area as well, getting one wasn’t too hard. I just had to check in with the forum frequently. I’m not sure if I decided to get the ticket before or after I knew the “pal” from the Hina Matsuri – who is not Iron Eve (check out the „Cast“ page for more information) – would want to go there too. I remember us talking about it on our way to or back from the Japanese feast. Anyway, I got a ticket for her and myself. While DarkFairy and I were at the Metalfest we also started talking about Wacken and she decided to come as well. So the hunt for a ticket started anew, but in the end I went from no ticket at all to having five tickets. Two of which went to friends of my colleague and fellow student. Though as I hadn’t heard anything from the pal until shortly before the festival I still had her ticket when she said she couldn’t come and I had to get rid of hers. Let me tell you: It’s no fun doing that two weeks before the festival. Everyone I replied to did not reply back, so in the end I was stuck with the ticket and 150 Euro unpaid by her until now. 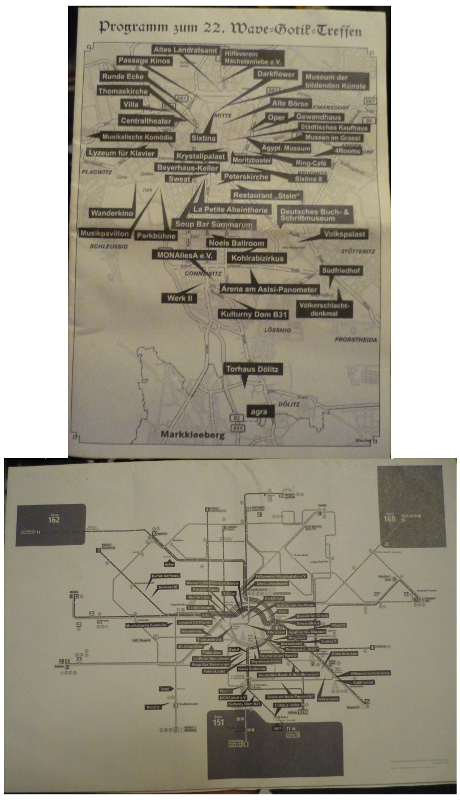 Regardless of all that nonsense above, Fairy and I planned our trip there and as I was staying at a room in Uetersen at that time Fairy decided to try out the new train that goes directly from Cologne to Hamburg and stayed a few days longer than just the festival. Needless to stay Fairy could still stay when I explained it to the landlady, but before she arrived there I picked her up at the train station in Hamburg Altona. It wasn’t fun getting there the first time as I somehow managed to find a rout – or rather my satnav did – that involved a lot of traffic lights and construction sides. A half an hour ride by car took me about an hour, so I got hopelessly late when her train arrived. I am still sorry that Fairy had to put up with all this, but I am still grateful that she did. During her stay we did some exploring around town and Hamburg, but I won’t be covering that in this post. Maybe in a post of its own, but I’m not sure yet. As I had to go to my lessons each day and nothing special was in the Running Order we stayed in Uetersen until Wednesday and used the time to work some more on „Warlords“ our book project (Find more about it on this Blog: dfppentertainment.wordpress.com). Thursday became our first day at the Open Air. We’ve been there pretty much the complete day – at least it felt like that, but we think we went there about noon. As we weren’t staying in the Camping Area we had to use the Parking Area for a Day and we kind of drove in a circle around the village before we found it. I think the first day it was already full, so we had to park in one of the streets nearby. 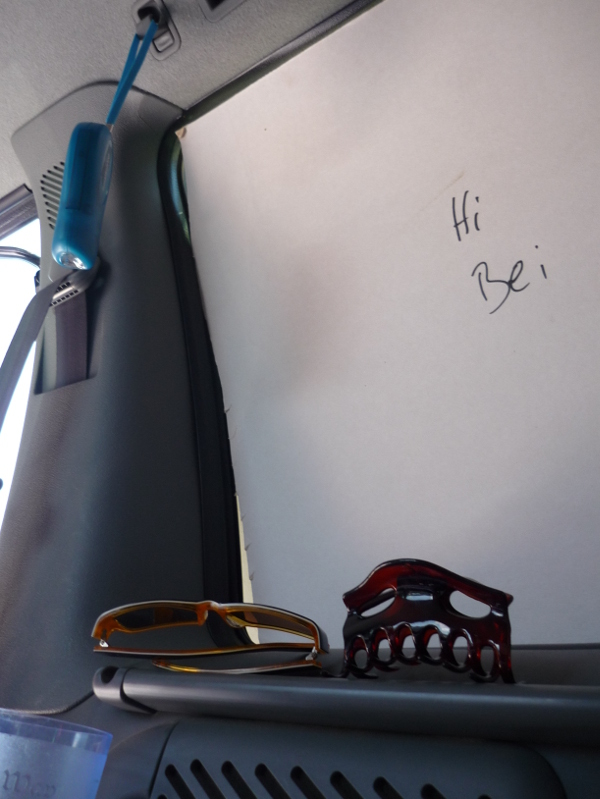 We scribbled down a little note for the window, that said we were sorry that we had to use the parking spot. It was a warm and dry day and it probably was the only day I could have worn my beautiful coat, but it was too warm for it. We used Thursday to explore the grounds to see the new attractions like the “Thrash of the Titans”-field and the „Bullhead City“ circus tent (which we never actually entered, as we found it weird to show the bracelets at the entrance). 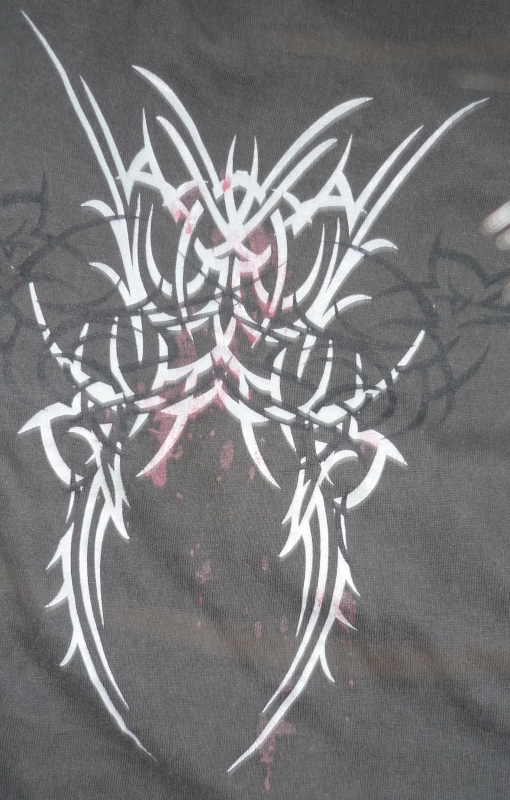 But also to have a look at the old stuff, as this was Fairy’s first Wacken. 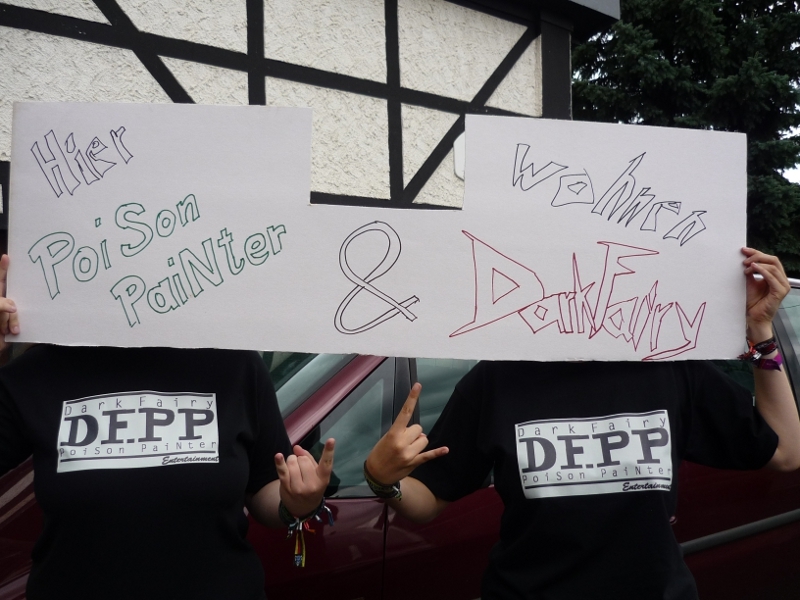 I think we even managed to get our festival-shirts that day. Music-wise did we only fully listen to U.D.O., whom I wanted to see at one of the previous years, but didn’t because of the late schedule-spot. We just sat down in front of the Main Stage and enjoyed the concert. While we did so a random guy came up to us, to ask if we had a program and then continued to sit and talk with us for a moment. I know U.D.O.s singer from his collaboration with Hammerfall on their cover of “Head over Heels”. I actually only discovered that it was this singer by coincidence as I heard an U.D.O. song in the Christmas calendar from the Metaltix-Homepage. The voice sounded familiar and I had to think of/remembered the song and then looked it up. So when that song was played I simply had to stop the conversation and actually listen for once. During this concert we by the way took the very first actual picture of both of us and we had met twice before this. Afterwards we might have seen a bit of Saxon but we decided to get going anyway as we were somehow pretty tired and exhausted from all the wandering around. Friday was one of the days were we would have liked to get to the festival earlier, but couldn’t as I had to attend some lessons that went way longer than the concert we wanted to see, which was Oomph! around noon. We only managed to get there in time for Hammerfall and they had already started when we were at the entrance of the Stage Area. During the night and the morning hours it had rained that much that the fields were so drenched that you couldn’t stand in one spot without moving your feet, without getting stuck, every few seconds/minutes we had to lift a foot to free it again. What we did see, however, were In Flames with their school uniforms and Rock music and they were quite nice. As it was already late when their show ended we contemplated whether we should stay for In Extremo or call it a day. We decided for the former and we did not regret it. The show was the same they had at the Metalfest, but still great. It was streamed on television as well, so my colleague wrote me that she was watching it too. When we finally got to my place after the concert it was about 4 o’clock Saturday morning, I think, and we had to get rid of the mud on our trousers. Little did we know, that that was only the beginning…. We had invited some fellow students of mine for barbecue on Sunday, like some kind of closure for Fairy, so we went to buy the stuff to get the barbecue working and meat, Fairy also got herself a bread-thingy and we returned to the house. One after the other had dropped out of the invitation, so only the guy from the MPS was left and we decided that we might as well have the barbecue at his place, with him and his flat-mate. At that point we had the firm conviction, that we had everything we needed: Stuff for the barbecue and meat. 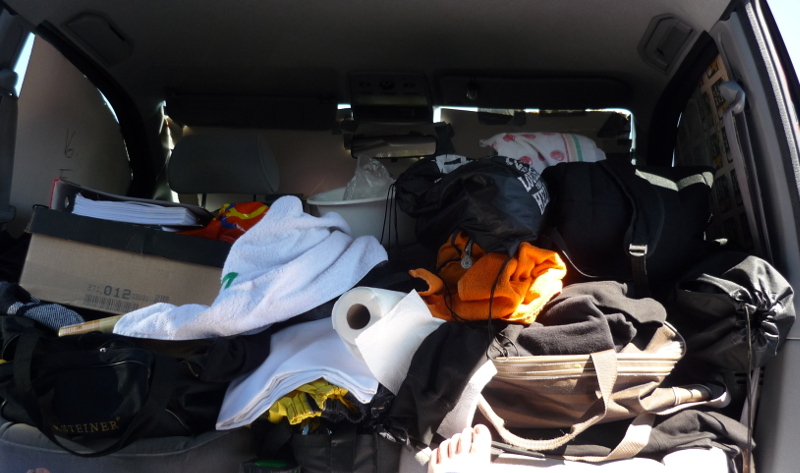 So we drove off to Wacken. Well…it again had rained, so the mud was even deeper now and you had to be really careful with every step you took, unless you actually wanted to end up doing the splits. I’m pretty sure we even saw one of The Incredible Blood Brothers stalking through the mud. I had seen them in person – not in their show – on a Horror Convention (The Weekend of Horrors, about which I might add a post one day [Edit: Look at the bottom for the Pingback] )). It was really interesting how everyone had different kind of techniques to advance. He had his shoes covered with a blue plastic bag. 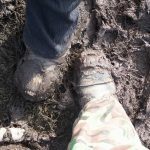 Others wore rubber boots – others none at all and we had our trusty boots to carry us through it; dirt in every gap of the shoe sole and mud nearly up to the knee. When it was time for Schandmaul we wade our way towards the Party Stage. We had contemplated for a while if we should see them or The Scorpions that would be playing parallel on one of the Main Stages. As it was far more likely the concert of The Scorpions would be recorded and displayed, the decision was clear. When the concert was about to start we moved on to find another spot to stand during the concert. Two funny things occurred throughout it. The first: While they played a thundery front was making its way towards the stage from the side. We watched the lightning and heard the thunder and when we had decided to put on our rain capes and had just finished doing that it poured down. Again. So we stood there partly wet (as we tried to clap along and the rain poured into the capes…), exhausted from all the walking through the mud, with no prospect of lunch the next day. But the show was great. They even finished before The Scorpions, so that we could watch the finale of their show on our way out. It made us glad we had chosen Schandmaul, as the singer of the Scorpions seemed old and tired – it was their retirement show after all. So that was a good choice there. As surprise act they had announced Edguy earlier that weekend, but as we had just seen them at the Loreley (Metalfest) as well, we decided to go and not wait until 2 o’clock for their performance, besides: It would be recorded. On some occasion when we stayed in the Wackinger Village we shortly listened to Vogelfrey, but I can’t recall which of their many concerts it was. 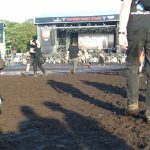 – “Knee deep in mud…” Sabaton must have found inspiration from Wacken. 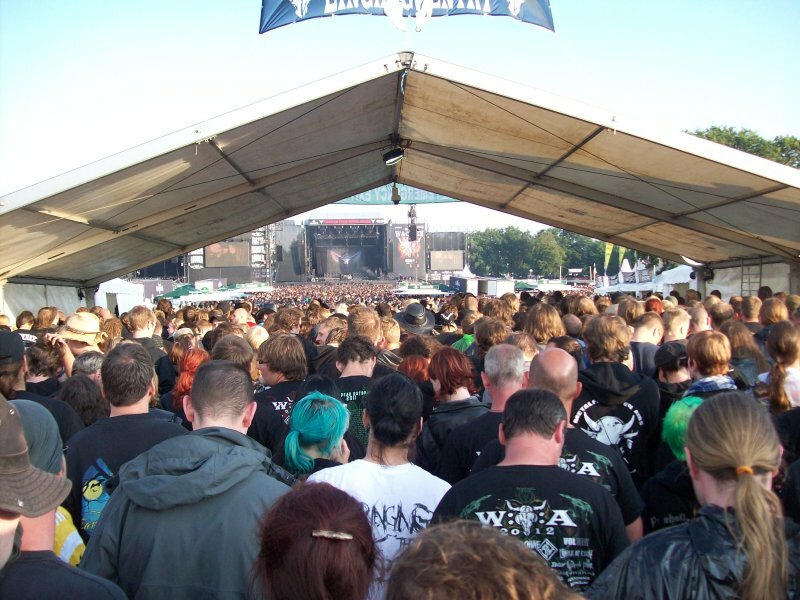 – Wacken is like Rock am Ring. Just better. Luckily no one was in there to hear her greeting and say something – though that would have been funny. I think I’ve mentioned the mud to quite some extend already, but let me tell you it was muddy and it was awful getting all the mud out of our clothes. 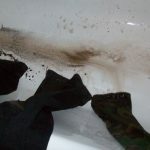 Trousers being washed out in the tub. 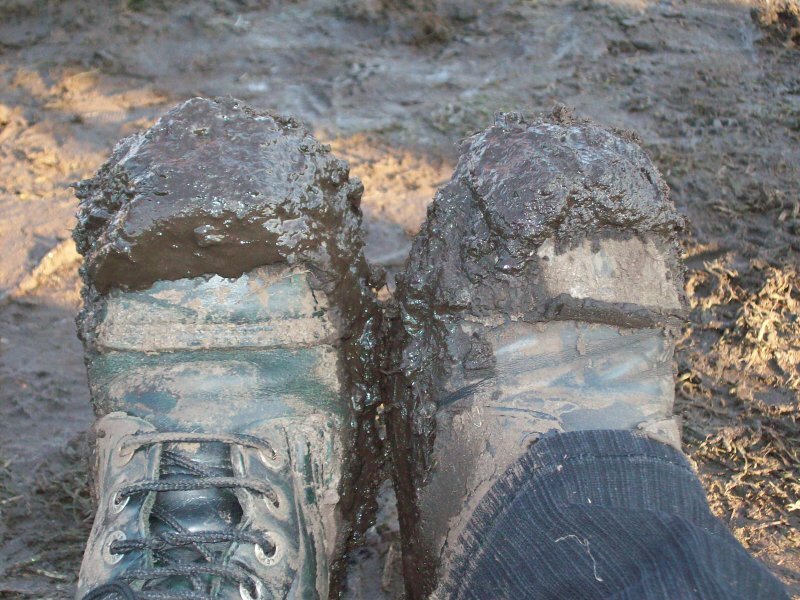 A look at our boots in the mud. 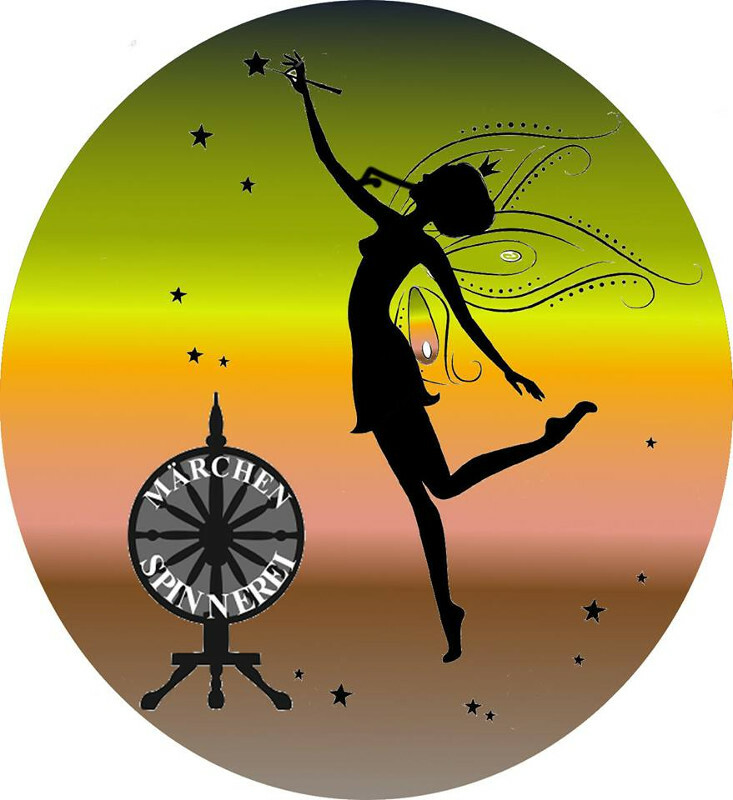 Well, Fairy attended the Rock am Ring the last few years and it’s one of two major Rock-Festivals in Germany (The other being Rock im Park) and therefore she could pretty well compare these two festivals. So in conclusion: We didn’t really saw that many concerts as we were way more comfortable with sitting in the dry and warm house and working on Warlords, but the once way did see were fun. Until the very last day, we had decided that we would not attend the next Wacken and focus on some minor festivals. Sabaton, Rage and some other good ones confirmed right from the start and more and more added to that throughout the end of last year.